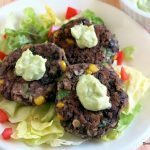 Vegetarian or Vegan Black Bean Cakes with Avocado Cream will become your go-to recipe on Meatless Monday…or any time you want to enjoy a tasty and healthy burger of black beans, corn and lots of spice. Cool things off with a quick avocado cream sauce topping! Tips to customize and make ahead! I am unapologetic about my love of black beans (and cilantro too…but, that’s another story!) If your kids, or any naysayers for that matter, say they don’t like beans, then introduce them to a recipe using the mild-flavored black bean variety that includes other flavors or types of cuisine they already enjoy. For example, chili lovers should try Sweet Potato Black Bean Chili. If Tex-Mex is more your style, put out a bowl of Fresh Corn and Black Bean Salsa. 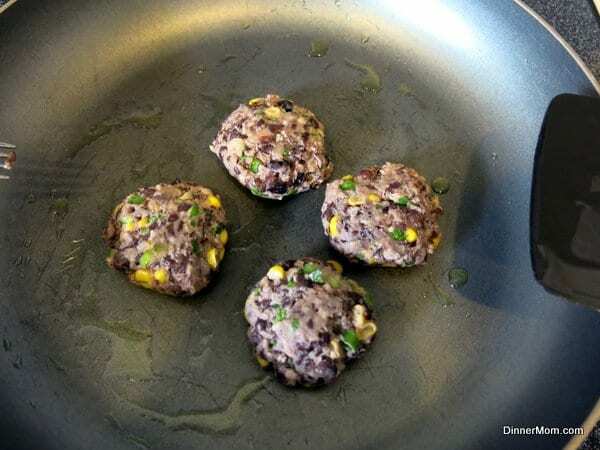 And, if burgers make a regular appearance on the menu, try these Black Bean Cakes with fresh corn, green onions and Panko breadcrumbs. Put it on a bun, top like a burger…or slather on some avocado cream. Make Vegetarian or Vegan Black Bean cakes. Since my daughter is vegan, we make them both ways. Mash about 3 cups of black beans using a fork or potato masher until they are the desired consistency. We like the beans a little chunky. Use a food processor for a smoother consistency. Add the rest of the ingredients to the mashed beans: corn off the cob, fresh cilantro, whole wheat panko breadcrumbs, salt, pepper, mayonnaise (clean-eating and/or vegan alternative) and red pepper flakes. These cakes pack some heat due to the red pepper flakes. Leave that spice out for a milder taste. 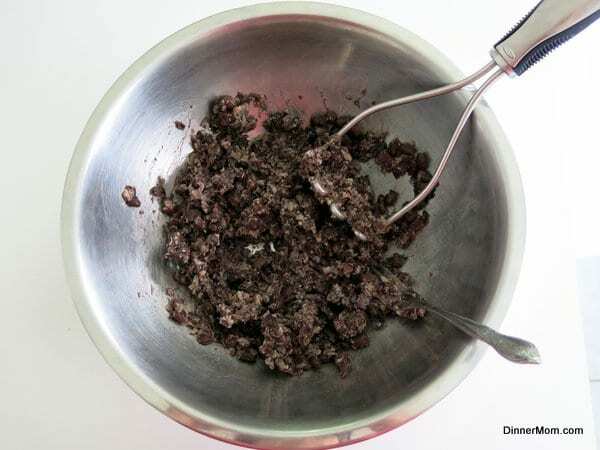 Use about a 1/4 cup of the mixture and form 12 patties. They will be on the small size, which makes them easier to work with in the frying pan. It’s best to let them congeal for at least 30 minutes (or overnight) in the refrigerator, if possible. We’re going to cover the second pan with a lid and plastic wrap and freeze them for later. We did this all the time at our make ahead meal assembly store! When you are ready to make dinner, spray a pan with olive oil. But, don’t put use too much. If you do, the black bean cakes will quickly soak up the oil and become extremely fragile during the cooking process. Allow them to cook for about 4 minutes on each side, turning only once if possible. Once cooked, remove the black bean cakes to a paper plate lined with paper towels. If you let them sit for a few minutes, they will firm up a little more. Top the black bean cakes with sour cream, Greek yogurt or fresh guacamole. 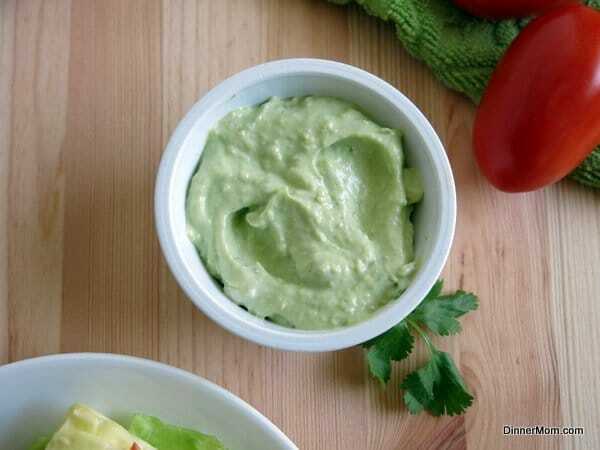 Or, make avocado cream (adapted from Annie-Eats) which is a pureed mixture of a Hass avocado, sour cream (or vegan substitute,) lemon juice and garlic. This cool topping perfectly offsets the heat! Make them ahead of time and store in the freezer – Assemble them into patties and freeze for up to two months. Defrost completely before cooking. 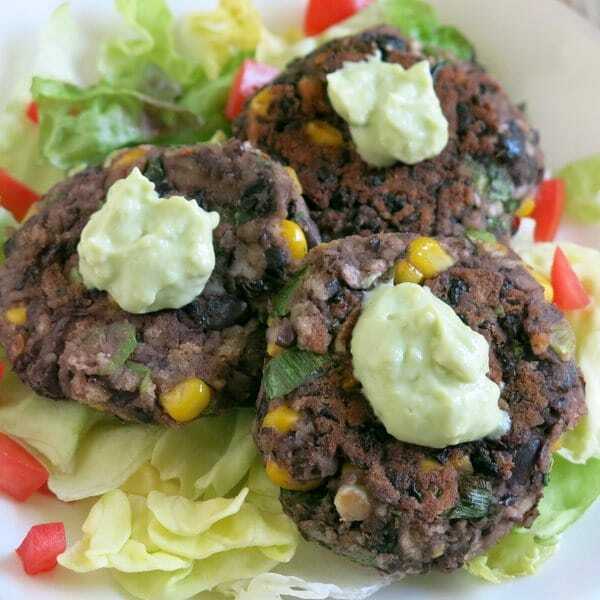 Make vegan black bean cakes – Use a vegan “mayonnaise” and “sour cream.” The mayonnaise is the “glue” of this recipe so to speak. This recipe was tested using vegan products! Keep them clean and healthy – Use mayonnaise and sour cream or Greek yogurt with real, minimally processed organic ingredients and whole wheat breadcrumbs. 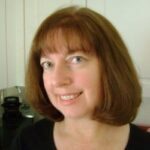 Make gluten-free cakes – Use gluten-free bread crumbs or cooked quinoa. Make them kid-friendly – Leave out the crushed red pepper and create a burger complete with ketchup, cheese and bun. Leave out the cilantro – Do it! Make appetizer-sized cakes – Make small Tablespoon-sized cakes. They’re a sure party hit! Please rate the recipe below and tag @DinnerMom on social media. We love to see what you are cooking up! 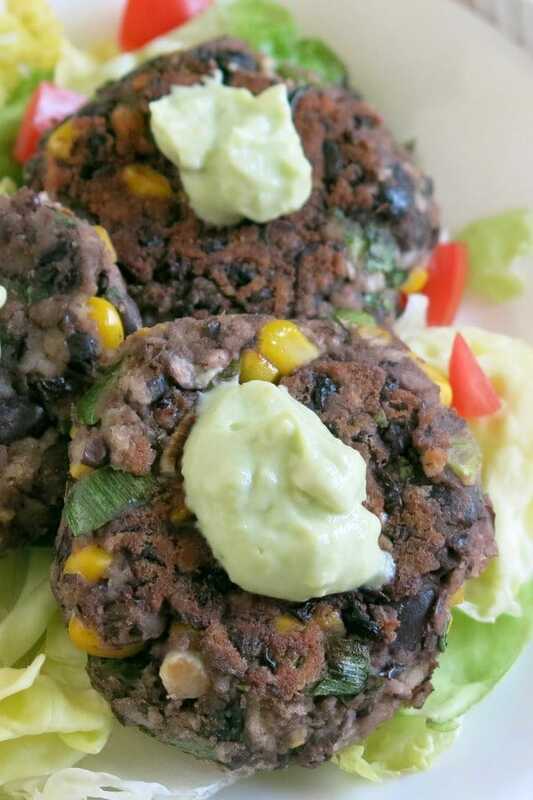 Black bean cakes with corn, green onion and cilantro and a little crushed red pepper, if you dare. Offset the heat with an avocado cream sauce. Make ahead and freeze too! Mash black beans with a potato masher or fork. Mixture will be slightly chunky. Add remaining ingredients to the bowl and mix until thoroughly combined. Form mixture into patties about a 1/4 cup each in size. Lightly spray frying pan with olive oil. Place black bean cakes in pan and cook for about 4-5 minutes on each side, turning only once. Remove to plate lined with paper towels and allow to set for several minutes. Serve with avocado cream or toppings such as sour cream or guacamole. Be careful not to use too much oil in the frying process or the black bean cakes will become fragile. 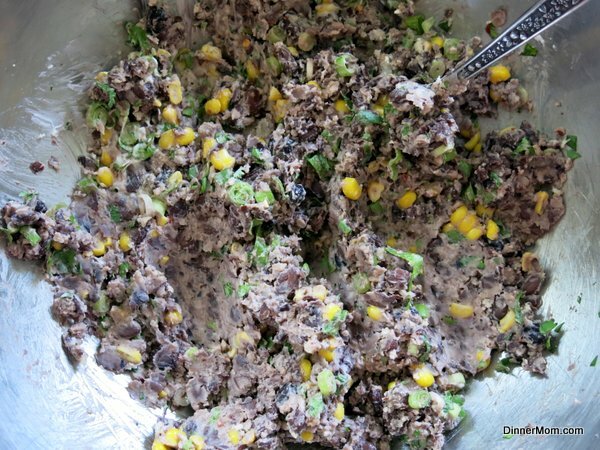 To make ahead and freeze, prepare recipe and make black bean patties. 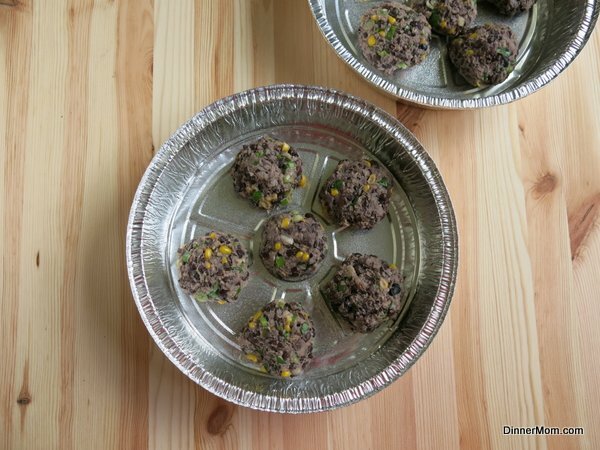 Freeze in a covered baking tin or transfer to a ziplock bag once the patties are frozen. Defrost completely and cook according to instructions. My hubby is more of meat and potatoes guy, but he liked them! I love black bean burgers but have never made them myself. This looks easy enough though, and delicious too! Thanks! They are very easy. I made a batch just the other night and replaced the mayo with mango chutney…a new variation coming soon! I’ve never tried a bean cake recipe, but I just got a pressure canner so beans will be on the menu more often in our house–no reason not to try these cakes! Thanks for all the tips–much appreciated. Yay! A pressure canner sounds like a good thing to have! I love that avocado cream!! I could just enjoy that with a spoon!! The cakes sound tasty too! These sound so good! The avocado cream seals the deal! I have a black bean cake recipe that I make for my family and they are always popular. The avocado cream sounds like the perfect topping! I just had nachos with avocado cream the other day! I think this is a sign I need to try these! I bet they are amazing. Im always up for a meatless recipe! This is just the thing I love, especially with that avocado cream! I love the idea of making these ahead and freezing! Will be pinning for sure! These look so good. I love your hints on preparation too. Just a little oil in the pan sounds great! Just today I had something similar at a restaurant. Soo cool to get the recipe from you. These black bean cakes are great, Marjorie! I love black bean ideas. I’ll make these this weekend for me!! Oh yummy, that is DEFINITELY the icing on the cake!.I love black beans (and cilantro), too – so these are going on my short list! These sound utterly delicious. I’m a huge bean lover so these are on my short list of recipes I want to make. Thanks for sharing. What an awesome vegetarian meal with some of my very favorite ingredients! Black beans and avocados go so well together! You made these look super easy to make! And I love black beans so I need to give them a try! 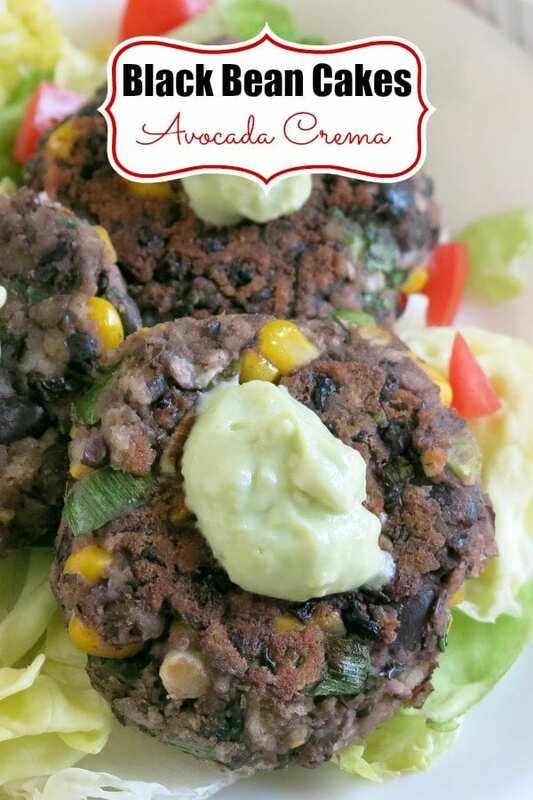 I’d love to make these black bean cakes extra spicy just so I could cool them off with the refreshing avocado cream. I loooove black bean burgers and the addition of avocado cream is just perfection!! I used to make black bean meatballs and they were so good! I will have to try these! I love black beans and I’ve been looking for a meatless recipe like this to try! Looks good! We made it for brunch today, by the recipe except for extra garlic and a sprinkling of cumin, and they were fabulous! Agree – the avocado cream is the bomb. This one is a keeper.